कई पत्रकार तो राज्यसभा के अपने शोज के जरिए मीडिया के चर्चित चेहरे बन गए. सीईओ और एडिटर इन चीफ के रूप में गुरदीप सिंह सप्पल ने राज्यसभा टीवी में जो संपादकीय आजादी दी और बहस-विमर्श का जो लोकतांत्रिक माहौल कायम किया, उसकी आज भी मिसाल दी जाती है. फिलहाल नए उप राष्ट्रपति के शपथ लेने के साथ ही गुरदीप सिंह सप्पल ने राज्यसभा टीवी को गुडबॉय बोल दिया और चुपचाप अपने नए वेंचर की तैयारी में लग गए. 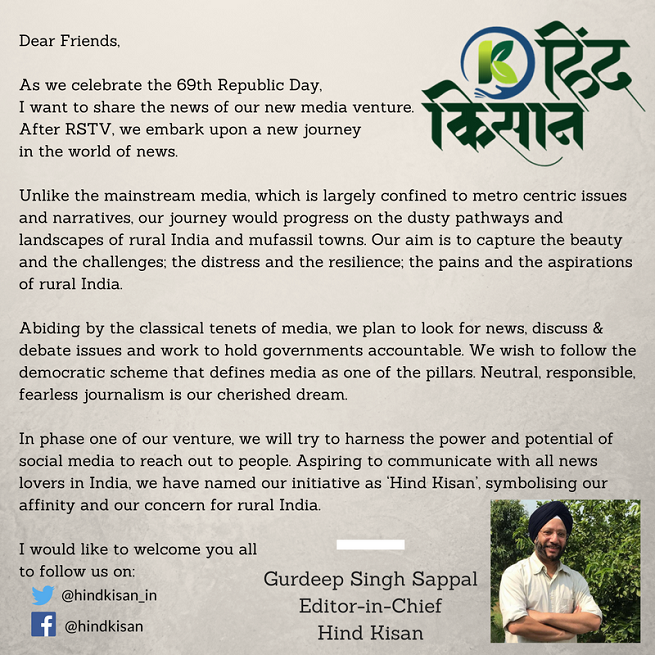 As we celebrate the 69th Republic Day, I want to share the news of our new media venture. After RSTV, we embark upon a new journey in world of news. Unlike the mainstream media, which is largely confined to metro centric issues and narratives, our journey would progress on the dusty pathways and landscapes of rural India and mufassil towns. Our aim is to capture the beauty and the challenges; the distress and the resilience; the pains and the aspirations of rural India. Abiding by the classical tenets of media, we plan to look for news, discuss & debate issues and work to hold governments accountable. We wish to follow the democratic scheme that defines media as one of the pillars. Neutral, responsible, fearless journalism is our cherished dream. Hind Kisan @hindkisan_in : Former Rajya Sabha TV CEO and Editor-in-Chief @gurdeepsappal introduces his new venture. Read his message. हिंद किसान वेब चैनल के शुरुआती दो वीडियोज देखें….